What’s the next trend in high end projection? When you work in the AV industry it’s easy to become blasé about the level of sophistication employed on installations of all kinds. We are constantly trying to push the envelope of what’s possible, while those outside the industry still gasp in amazement at even the simplest of projection mappings. My point is that it’s easy to forget that many people simply haven’t been exposed to projection events and mappings. But equally, we’ve only really scratched the surface of what’s possible. One of the main vertical markets for Panasonic is the Entertainment market, where Panasonic has been able to establish our 20,000 lms and 30,000 lms projectors as the platform for big events and big touring shows in Europe. This installation projector market has grown year on year since around 2013. And, Panasonic has lead the market since 2012, maintaining a market share close to 40%. Market leadership, such as this, means we have a responsibility to help drive further market growth. But how and where is the market growth going to come from? In its infancy, projections mappings took place on flat surfaces using simple content. By 2014, the potential for projection mapping had expanded thanks to the increased use of media servers, allowing for more complex content. We’ve seen outdoor mapping events became very popular across Europe. But what’s next? It was the desire to stretch the envelope of the rental and staging sector that led us to collaborate with Balich for their new approach to the entertainment, which they’ve labelled Artainment! ‘Guidizio Universale. Michelangelo and the secrets of the Sistine Chapel’ is a show in Rome by Marco Balich, the artistic director and producer of the Olympic ceremonies in Turin 2006 and Rio 2016, which aims to bridge the gap between culture and AV technology, thus ‘Artainment’. This saw a 270 degree projection within the Sistine Chapel, marking the important phases of Michelangelo’s life alongside his most famous works. Far from being a supporting cast member responsible for creating backdrops and adding colour to the stage, projection plays a lead role and makes every wall within the Auditorium Conciliazione a surface for rich video content. Another innovation, that we reflected on our booth at ISE 2018, is the move towards 3D projection mapping and tracking. This type of AV solution combines tracking software combined with media servers and laser projection. It was utilised successfully for the Fast and the Furious live tour, where 48 high brightness projectors blended two projection surfaces – the arena floor and a back wall, while also live mapping 42 cars driving around the venue in real time. As a result, a Hollywood blockbuster was transported from the big screen to a live environment, allowing fans to see a new form of immersive experience featuring their favourite characters and cars. Such large scale events are complicated and costly. For me the obvious next step is to combine simple tracking technology with projectors so that on a smaller scale, it’s possible for simple content to be projected real time on to actors and performers as part of the event. 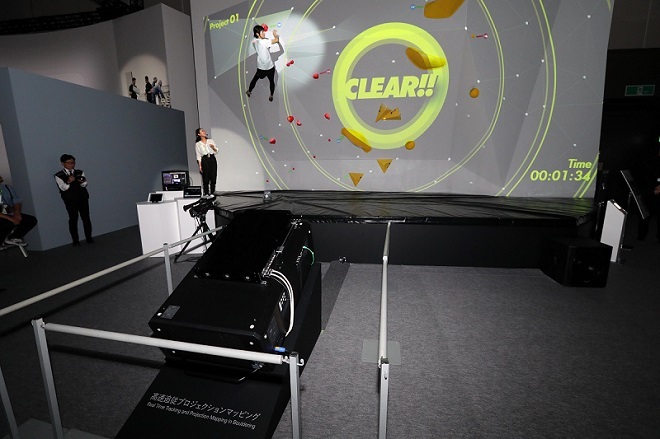 Panasonic showcased something akin to this at its recent Cross Value Innovation Forum in Tokyo. 4K projection was combined with an additional sensor technology to bring a wow effect to live and sporting events. We have a phrase within Panasonic, which is the freedom to create. The thinking behind it being that our technology is so solid and reliable that it allows people to concentrate on their creativity. We are convinced that our technology is the platform on which creatives such as Balich can create new methods of entertainment.